A girl thought to have mental retardation (MR) as a toddler, was presumed to have had hypoxic birth injury, after a computed tomography scan of her brain done at 2 years of age was uninformative. Over time, she had neurological development with delayed milestones and presented for poor seizure control several years later when she was 12-year-old. She had numerous papulonodular lesions on both cheeks and nose [Figure 1]a which had been noted for several years. Tuberous sclerosis was suspected and confirmed later by magnetic resonance imaging that showed subependymal nodules in the walls of the ventricles and multiple “tubers” - in frontal and parietal subcortical areas bilaterally [Figure 1]b and [Figure 1]c. Sodium valproate was started, and seizures were controlled. As described by Osborne, the term adenoma sebaceum is a commonly used misnomer for facial angiofibromas occurring as a skin manifestation of tuberous sclerosis. These lesions appear in infancy or early childhood in a characteristic butterfly-shaped pattern  over both cheeks and the nose. They are usually symmetrical and most commonly occur in the nasolabial folds. The upper lip is usually spared. Its presence is one of the major diagnostic criteria for establishing the diagnosis of tuberous sclerosis. 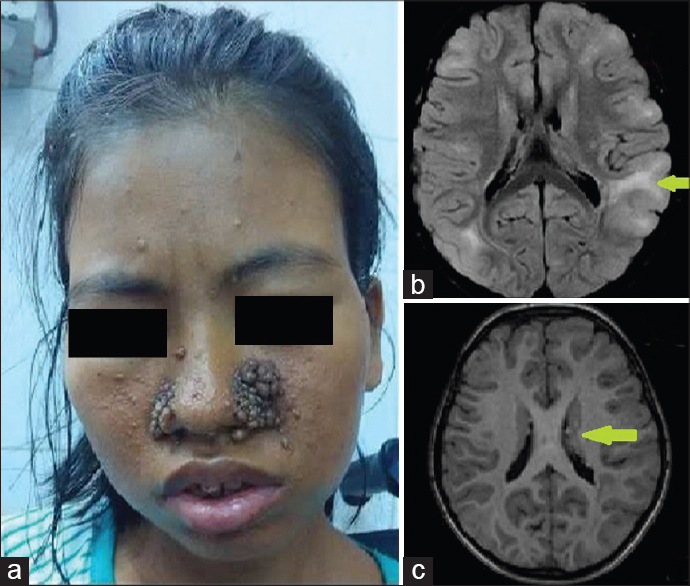 Although differential diagnosis of this condition would include acne vulgaris, rhinophyma, and sebaceous hyperplasia, adenoma sebaceum presenting along with seizures and MR (Vogt's triad) acts as a pointer to the need for cranial imaging. As the severity of these lesions does not correspond to the extent of nervous system involvement and since milder versions of tuberous sclerosis are eminently treatable, optimal imaging should be done rather than stamping these children as having hypoxic birth injury. These cosmetically disfiguring lesions (composed of vascular and fibrous tissue) can be removed by laser or dermabrasion. Osborne JP. Diagnosis of tuberous sclerosis. Arch Dis Child 1988;63:1423-5. Goodrick S. The road to Vogt's triad. Lancet Neurol 2015;14:690. Hemady N, Ohri S. Papulonodular lesions in a man with seizures and mental retardation. Adenoma sebaceum. Am Fam Physician 2009;79:48, 51. Swaroop MR, Nischal KC, Rajesh Gowda CM, Umashankar NU, Basavaraj HB, Sathyanarayana BD. Radiofrequency ablation of adenoma sebaceum. J Cutan Aesthet Surg 2008;1:89-91.